Amphiregulin in vitro SimpleStep ELISA® (Enzyme-Linked Immunosorbent Assay) kit is designed for the quantitative measurement of human Amphiregulin protein in serum, plasma (citrate and EDTA), and cell culture supernatants. Bifunctional growth-modulating glycoprotein. Inhibits growth of several human carcinoma cells in culture and stimulates proliferation of human fibroblasts and certain other tumor cells. Belongs to the amphiregulin family. Our Abpromise guarantee covers the use of ab222504 in the following tested applications. Example of human Amphiregulin standard curve in Sample Diluent NS. The Amphiregulin standard curve was prepared as described in Section 10. Raw data values are shown in the table. Background-subtracted data values (mean +/- SD) are graphed. 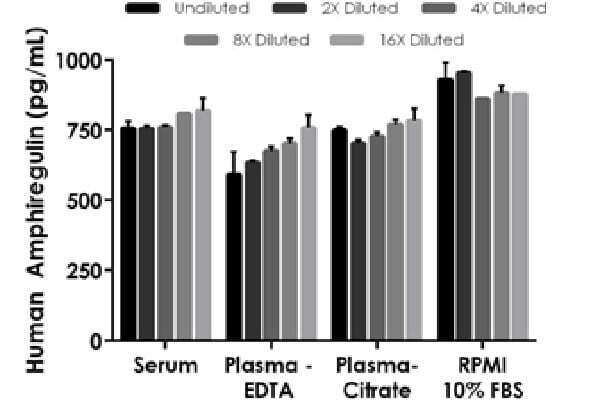 Interpolated concentrations of spiked Amphiregulin in human serum, plasma and cell culture supernatant samples. The concentrations of Amphiregulin were measured in duplicates, interpolated from the Amphiregulin standard curves and corrected for sample dilution. Undiluted samples are as follows: serum 50%, plasma (EDTA) 50%, plasma (citrate) 50%, RPMI media 50%. The interpolated dilution factor corrected values are plotted (mean +/- SD, n=2). 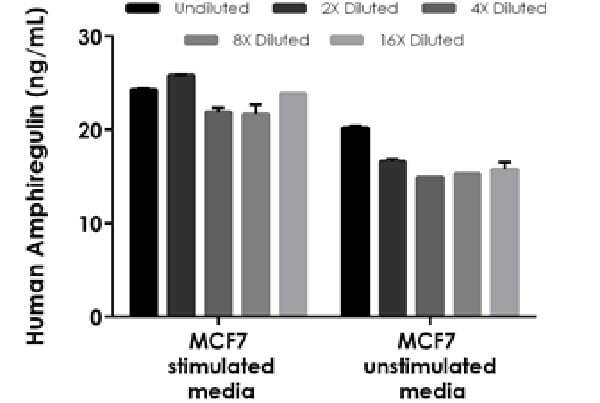 Interpolated concentrations of native Amphiregulin in human MCF7 cell culture supernatant. Human MCF7s were stimulated with 2% PHA for 3 days before the supernatant was collected and assayed. 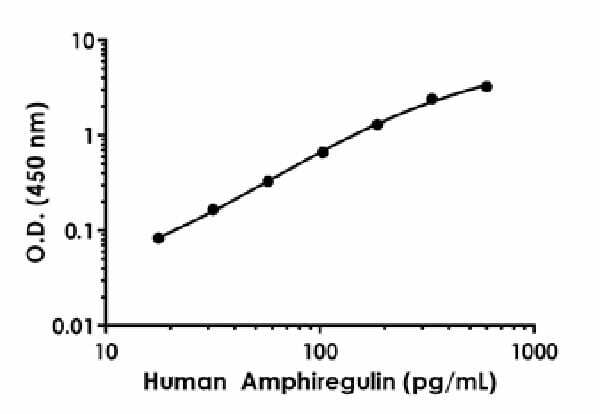 The concentrations of Amphiregulin were measured in duplicate and interpolated from the Amphiregulin standard curve and corrected for sample dilution. The interpolated dilution factor corrected values are plotted (mean +/- SD, n=2). The mean Amphiregulin concentration was determined to be 23.7 ng/mL in stimulated and 16 ng/mL in unstimulated MCF7 cell culture supernatant. ab222504 has not yet been referenced specifically in any publications. There are currently no Customer reviews or Questions for ab222504.